With the national student loan debt totaling $1 trillion dollars and steadily growing, many prospective students are looking for cost-effective routes to a postsecondary degree. While attending a public college as an out-of-state student has traditionally meant an exorbitant price hike (CollegeBoard.org reported that out-of-state students paid an average of $15,650 more than their in-state peers in 2017-18), many public institutions are leveling the playing field by offering competitive rates for all students. Some offer residents and nonresidents the same tuition, while others charge only slightly more. 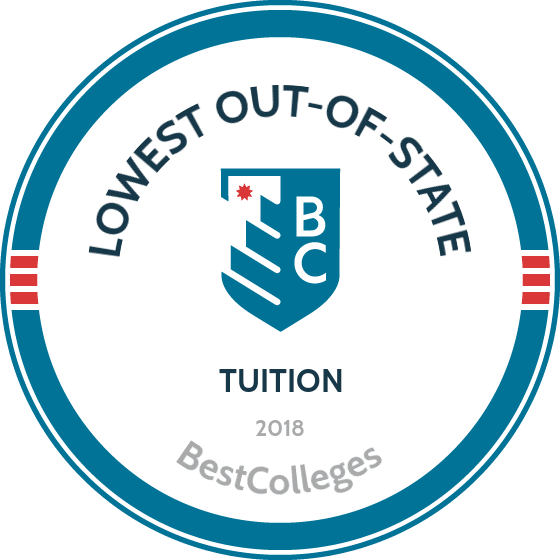 The list below features 50 colleges and universities offering the lowest out-of-state tuition in the U.S. Our goal is to provide a data-driven resource for financially minded students wanting to leave their home states. Students from outside Nebraska pay just one dollar more per credit hour than residents, making an education at Chadron State College an affordable option. Knowing each credit hour costs just under $200, students can use the institution's online calculator to understand the exact price of their education. CSC is also recognized for providing cost-effective room and board options, with the average package costing $5,760 per year. Undergraduate and graduate students can choose from over 70 majors. Chadron's online learning programs are extensive, with many different courses and majors offered wholly online. The student to faculty ratio is 19:1, with average class sizes of 17 students. Students enrolled at Oklahoma Panhandle State University all pay the same tuition rate. The average yearly cost totals $6,739. Those opting to live and eat on campus also have access to competitive rates: the average student spends $4,823 on room and board per year at OPSU. Online courses cost an additional $100 to cover extra expenses and supplies, while textbooks average $150 per semester. Nearly 100 undergraduate degrees are available, while online students can choose from over 340 different courses offered at the associate and bachelor's levels. Areas of study include agriculture; business and technology; education; science, math and nursing; and University College for adult students. Nearly 2,000 students currently attend OPSU. Offering in-state tuition to all students, Minot State University attracts applicants from around the nation. Annual tuition for full-time undergrads rings in at $6,086 while those pursuing a master's degree can expect to pay $7,820. Room and board factors in at $5,490 regardless of degree level, and students should tack on an extra $1,100 each year for books and supplies. International students pay the same amounts, with the addition of mandatory health insurance costing $2,364 each year. MSU currently has nearly 3,500 students completing bachelor's and master's level programs in more than 70 degree areas. The university has four main academic divisions, including the colleges of arts and sciences, business, education and health sciences and the graduate school. Students from outside Louisiana attending Southern University at New Orleans can expect to pay $4,911 in annual tuition. Books and supplies ring in at $1,400, while those electing to live and eat on campus can tack on an additional $7,080 per academic year. International students are charged the same rates. According to CollegeBoard, these figures total to less than one-third the amount most students pay at a four-year public college as an out-of-state student. SUNO was founded in 1956 and is a historically black college. The university offers nearly 25 degrees at the associate, bachelor's and master's levels. In addition to its on-campus offerings, the university also has a robust online learning program. All students enrolled at MVSU pay the same amount for tuition. Undergraduates can expect costs of $5,916 per year, with an additional $6,836 added for those who choose to take up room and board on campus. Totaling $12,752, the yearly cost is nearly 80% below the national average for out-of-state students attending a four-year public college. Enrolled students pay an additional $1,400 for books and supplies. The university offers a number of institutional scholarships to help cover costs. MVSU is the youngest college in the historically black grouping of higher education institutions. U.S. News & World Report ranked the school as "One of the Best" in the southern region. The university is currently home to over 2,200 students and maintains a 13:1 student to faculty ratio. Students from across the U.S. can enroll at PSC and receive the same tuition rate as their in-state peers. Full-time undergraduates pay $6,188 annually, with an additional $7,232 for room and board. In addition, the university estimates that students spend an average of $2,656 on other expenses throughout the year. Students should also be prepared to spend $1,056 annually on books and supplies. Both in-state and out-of-state students pay the same rate for online classes, although prospective students should note that online costs are higher than campus-based tuition. PSC offers 13 undergraduate degrees and two master's programs. An additional eight online programs are also available. Over 2,500 students are currently enrolled at the college, and most class sizes are kept to fewer than 20. In addition to cost-effective tuition and fees, 92% of first-time undergraduates received some form of financial aid, including grants, scholarships, loans or work-study funds. Out-of-state students at New Mexico Highlands University can expect to pay $6,382 in annual tuition and fees, with an additional $7,404 for room and board expenses. $1,000 should be factored in for books and supplies each year, and the university estimates that most students spend approximately $3,836 a year in other expenses. Graduate students from outside New Mexico's borders pay $7,698 in tuition each year. NMHU prides itself on ethnic diversity: Over 80% of the student body is made up of students who identify as a minority. In the 2012-13 academic year, 73% of all students received financial aid, averaging $5,181 per year. Some students at the university took out additional federal loans to pay for their education, averaging $6,164 per year. All undergraduates at Delta State University pay the same tuition. In the 2014-15 academic year, this totaled $6,562, while books and supplies accounted for an additional $1,100. Students electing to live and eat on campus are charged $7,200 per year, and the university estimates students spend an additional $4,025 on other miscellaneous expenses. This annual total of $13,762 for tuition and room and board expenses is far below the national average for public four-year institutions, making DSU a great out-of-state value. DSU provides a number of institutional scholarships to help students pay for their education. The university offers over 50 majors for students seeking bachelor's, master's and doctoral programs. Nearly 4,800 students currently call DSU home, and students enjoy an 18:1 student to faculty ratio. As a North Dakota school, DSU is able to offer some of the lowest room and board costs in the nation, totaling $5,850 each year. Out-of-state students can also expect competitive tuition rates: the 2014-15 academic year saw non-residents pay $8,495. While costs for textbooks and other supplies vary by major, the university advises students to expect costs of approximately $1,200 each year. DSU offers 51 bachelor's degrees, four associate degrees and two certification programs spread across 10 academic departments, taught across day, evening and online classes. The university is committed to providing an intimate learning environment, maintaining an 11:1 student to faculty ratio for the 1500+ students who call DSU home. In the 2012-13 academic year, 73% of all first-time undergraduate students received grant or scholarship aid, averaging $3,821 per year. Located just outside Amarillo, WTAMU draws students nationwide thanks to its academic rigor and low tuition costs. In 2014-15, out-of-state students paid $7,538 in tuition, with an additional $1,000 earmarked for textbooks and academic supplies. Those electing to live and dine on campus paid an additional $7,376. All in, out-of-state students paid just shy of $15,000 each year for their education, well under half of the national average for public four-year colleges. Nearly 9,000 enrolled students take advantage of more than 100 degree programs offered at the bachelor's, master's and doctoral levels. In addition to institutional scholarships, 77% of first-time undergraduates received a federal grant, averaging $6,121. Despite its growing size, WTAMU remains devoted to the individual student: the student to faculty rate remains steady at 19:1. ASU attracts students from across the nation to three campuses spread across Mississippi, thanks in part to the school's commitment to providing the same tuition rates for both resident and nonresident students. In the 2014-15 academic year, students paid annual tuition rates of $6,200, compared to the national average of $22,958 for out-of-state students attending a public four-year college. If electing to live and eat on campus, students tacked on an additional $8,650. Books and supplies totaled $1,510. The university is a historically black institution, founded in 1871 as the first black land grant college in the nation. Nearly 4,000 students take advantage of more than 50 fields of study offered as associate, bachelor's, master's and specialist degree programs. In the 2012-13 academic year, 89% of undergraduates received grant or scholarship aid, averaging $7,507 per year. Out-of-state students at Mayville State University can expect to pay less than half the national average for non-resident students attending a four-year public college. With annual tuition charges of $8,894, and room and board fees totaling $6,452, the final number is well below the cost of many comparable institutions. Students should expect to pay approximately $1,000 per year for textbooks and academic supplies, while the university estimates that students will spend around $3,100 each year in miscellaneous expenses. MSU offers 31 academic programs, available at the associate and bachelor's degree levels. Mayville was the first university in the nation to become a tablet PC campus; every student and faculty member is issued this piece of technology upon starting at MSU. Given its small size, the university is able to offer individualized attention for students. Most classes have 15 or fewer students, and the student to faculty ratio is 13:1. Full-time, non-resident students at DSU paid $9,986 in tuition and fees during the 2014-15 academic year. Many of these students elected to live and dine on campus, resulting in an additional charge of $5,941, while textbook and supply costs added $1,000 for the year. Prospective students should also be aware of a $390 wireless computing fee, which includes access to a tablet, the DSU network, software and campus tech support. The university is committed to helping students succeed upon graduation: the latest graduating class saw a job placement rate of 95%. In the 2013-14 academic year, 79% of students received financial aid, with an average of $9,917 awarded to each student. Students can take advantage of over 40 degrees offered at the associate, bachelor's, master's and doctoral levels. All students enrolled at Southwest Minnesota State University pay the same rate for tuition. In the 2014-15 academic year, this amount totaled $8,074. The university has a banded tuition policy, meaning students who take between 12 to 18 credits pay the same rate. Room and board comes to $7,352 per year on average, books and supplies total $1,200 and the university estimates that students spend about $3,200 on personal expenses per year. The university is part of the "20/30 Club," a group of institutions whose annual tuition rate is below $20,000, yet graduates earn more than $30,000 annually in their first jobs. In the 2014-15 academic year, 87% of undergraduates received financial aid award packages averaging $10,620. The university is home to nearly 7,000 students and maintains a student to faculty ratio of 26:1. Over 4,700 undergraduates at Bemidji State University take advantage of the university's cost-effective tuition rates, which totaled $8,134 for all students in the 2014-15 academic year. Students also paid $900 for their textbooks and academic supplies. Those electing to live on campus paid an additional $7,470, while the school suggests students should plan to spend an additional $2,800 each year on personal expenses. Students from 35 states and 30 countries currently take advantage of the 60 majors and pre-professional programs offered by the university. More than two-thirds of first-time undergraduates choose to return to BSU after their first year. 90% of all undergraduates receive financial aid in the form of scholarships, grants, work-study compensation or loans. In addition to the university's many associate, bachelor's and master's programs, students also choose BHSU for its low tuition rates. During the 2014-15 academic year, out-of-state students paid $10,097 to undertake a full-time course load, plus $1,200 for textbooks and academic supplies. Students who took advantage of on campus room and board paid an additional $6,330. Miscellaneous expenses such as laundry, transportation and dining out tallied $4,300 for the year. The university offers five different campuses for learning in addition to a variety of distance education options. The school offers over 90 degree programs spread across all academic levels, in addition to 20 pre-professional programs. The current student body comprises students from 44 states and 29 countries. Within the undergraduate community, 53% of students received grant or scholarship aid averaging $4,271 per academic year. Out-of-state students attending Northwestern Oklahoma State University paid approximately $12,293 during the 2014-15 year, with books and supplies costing an additional $1,200. Students who choose to live and dine on campus can expect to add $4,230 to that figure. Other expenses, such as transportation, personal costs and laundry services, average $3,600 per year. U.S. News & World Report has highlighted the university for having the most affordable campus housing in America. Over 2,500 students take advantage of undergraduate degrees offered in 40 areas of study via the schools of arts and sciences and professional studies. Over 57% of NOSU attendees graduate with no student debt. In the 2012-13 academic year, 96% of first-time undergraduates received some form of financial aid. At Wayne State College, out-of-state undergraduates paid $9,804 for tuition during the 2014-15 academic year, though students from Illinois, Indiana, Kansas, Michigan, Minnesota, Missouri, North Dakota and Wisconsin qualified for in-state rates as part of the Midwest Student Exchange Program. Textbooks and classroom supplies tacked on an extra $1,100, while students opting for on-campus room and board paid an additional $6,420 per year. Personal expenses such as transportation, food and entertainment are estimated to total approximately $2,712. The university has been recognized for having the most affordable tuition throughout the region. The most popular undergraduate degrees include business administration, elementary education, criminal justice, industrial technology, human service counseling, life sciences and special education. 83% of recent graduates found work in their field or go on to attend graduate school for further education; 16% are employed in other fields. Nonresidents paid approximately $10,042 in tuition per year while enrolled at Northern State University, in addition to $1,200 for textbooks and supplies. While not mandatory, those who opted for room and board paid an additional $6,942. The institution estimates students will need $3,800 per year to pay for miscellaneous expenses such as transportation, laundry and technology. The university has a guaranteed four-year scholarship program, with funding amounts dictated by a student's ACT/SAT score. U.S. News & World Report has ranked NSU as one of the nation's top regional public schools for six years in a row. The university currently has over 4,100 enrolled students taking advantage of 43 bachelor's degrees, seven associate programs and nine master's degrees. 95% of first-time students undertaking full-time study receive financial aid. Boasting tuition at half the price of comparable Georgia institutions, Gordon State, in Barnesville, GA, prioritizes affordability for out-of-state and in-state students alike. For the 2015 fall semester, out-of-state tuition for a full 15 credit hours sits at $5,661, or $377.40 per credit hour. Mandatory fees associated with tuition total to $311 for students taking 4 credits or less each semester, regardless of in-state or out-of-state status; fees for 5 credits or more come to $550. For 2015, traditional dorm charges come to $1,715 per semester; at 9 meals per week, meal plans come to $1,280 per semester. Tuition for eCore classes, the programs online course management system, comes to $169 per credit hour. Cappex.com reports that annual institional aid averages out to $2,332 per student, with 93% of students receiving aid. During the 2014-15 academic year, students from outside Louisiana paid $8,274 for tuition, while books and class supplies added $1,200. Students who lived and ate on campus paid an additional $8,003. At $16,277 for the academic year, total costs are almost half the national average for non-resident students attending a public four-year university. Students should also plan for other expenses, such as technology, laundry or transportation, estimated to be $3,680 per year. Nearly 6,800 students are currently enrolled at SUAMC and enjoy a 15:1 student to faculty ratio. Over two third of first-time freshmen students elect to continue their education at the university in their second year. 80% of all undergraduate students receive grant or scholarship aid, averaging $5,537 per student. At Eastern New Mexico University, out-of-state students pay $10,633 in tuition, over $12,000 less than the national average cost for non-resident students attending a public four-year university. School supplies and textbooks average $950 per year, while room and board add $6,452. The institution also advises students to expect approximately $4,375 of expenses, such as transportation, laboratory fees and laundry services. Students from Alaska, Arizona, California, Colorado, Hawaii, Idaho, Montana, Nevada, North/South Dakota, Oregon, Utah, Washington or Wyoming are eligible for the Western Undergraduate Exchanges, which provides further discounts on tuition. Nearly 6,000 students currently take advantage of more than 60 associate, bachelor's and master's programs. 95% of these students have indicated they are satisfied with the university. The school has been federally designated a Hispanic-Serving institution and is a member of the Hispanic Association of Colleges and Universities. Many out-of-state students choose to attend the main campus of Southern Arkansas University, thanks in part to highly competitive tuition rates. In the 2014-15 academic year, non-residents paid $11,186, alongside $1,500 for textbooks and school supplies. Living on campus costs an additional $6,140, while all students had personal and miscellaneous fees that averaged $5,017 for the year. In the last 13 years, the university has spent nearly $100 million on new buildings and improved facilities. Over 3,400 students take advantage of certificate, associate, bachelor's and master's offerings in more than 90 degree areas. 97% of all first-time undergraduates receive financial aid in the form of grants, scholarships, work-study programs or loans. Students from outside South Dakota can expect to pay $10,485 in annual tuition fees at SDSU, with an additional $1,500 earmarked for academic supplies and textbooks. Room and board is a popular option for many non-residents; totaling $9,000 per year for a double-occupancy room. In addition to these costs, the university estimates students will spend $6,798 per year on a variety of fees and personal expenses. A minimum of $1,000 per academic year is awarded to those students who have earned a 24 or higher on the ACT examination. The Carnegie Foundation ranked SDSU as the number one higher education research institution in the state. Over 12,000 undergraduate, graduate and professional students call SDSU home, with 42% coming from outside South Dakota. 91% of first-time freshmen receive financial aid, while 53% receive institutional scholarships. The average scholarship amount for 2013-14 was $2,329. At Missouri Southern State University, non-residents paid approximately $10,450 in tuition for the 2014-15 academic year, over $12,000 less than the national average for out-of-state students attending four-year public institutions. Textbook and supply costs also sit far below the average, totaling $761. Room and board offerings are an additional $6,299. Learners averaged $3,289 in personal expenses per academic year. The university serves close to 6,000 students with over 200 academic programs catering to associate, bachelor's and master's level students. The university prides itself on providing a richly diverse learning experience. As of 2014, 19% of all students identified as a minority. 83% of all first-time freshmen received grant or scholarship aid, averaging $4,934 per year. SWOSU attracts numerous out-of-state students, thanks in part to its competitive non-resident tuition rates. For the 2014-15 academic year, out-of-state tuition totaled $12,270, with an additional $1,218 for supplies, including textbooks. Many students from further afield choose to take advantage of the university's room and board provisions, adding $5,076 to the annual student bill. Given the university's sizeable endowment, it offers a variety of scholarships for students who show promise in academics, athletics or special talents. Students can take advantage of over 1,000 different classes offered at the associate, bachelor's, master's and doctoral levels. Classes are kept small, the average course has 23 students. The university hosts students from 34 states and 34 countries. At Arkansas Tech, out-of-state students pay less than half the national average for non-resident students enrolled at public four-year institutions. In the 2014-15 academic year, tuition totaled $10,878, with an additional $1,410 for supplies and textbooks. The university has numerous options for room and board, averaging $6,734. Other expenses, such as transportation, laboratory fees and personal costs are approximately $2,948 per year. Over 12,000 students are spread across the university's two campuses, taking advantage of a variety of programs at the associate, bachelor's and master's levels. 95% of first-time undergraduates received financial aid in 2012-13, including grants, scholarships, work-study programs and loans. ATU is ranked second in the state for graduation rates and is the most affordable school among Arkansas's top five universities. Nonresidents who choose to study at Youngstown State can expect to pay $8,557 for full-time tuition, though students from surrounding counties in New York, Pennsylvania and West Virginia may qualify for the Affordable Tuition Advantage rate. Textbooks and supplies cost approximately $1,100, while room and board is an additional $8,645. Other miscellaneous costs, like gas, laundry and individual course fees, total $3,692 yearly. Over 13,000 students are currently enrolled in 115 certificate, associate and bachelor's programs, 44 master's programs and three doctoral programs. YSU has been recognized for offering the best tuition value among Ohio's 11 largest public universities. Over $138.8 million was disbursed in financial aid during the 2012-13 academic year. Students from all over the country call Midwestern State University home, as a result of its excellent academic offerings and competitive out-of-state tuition rates. During the 2014-15 academic year, non-resident students paid $9,703 for their classes. Room and board adds an additional $7,374 while textbooks and class supplies total $1,200 annually. Students can also expect to spend approximately $1,783 on miscellaneous expenses such as transportation, laboratory fees and laundry services. The university has a significant endowment, allowing it to offer merit and need-based scholarships to those who qualify. 5,874 students are currently enrolled and represent all 50 states and 53 foreign countries. There are over 100 student organizations, 14 nationally affiliated fraternities and sororities and a variety of intramural sport teams. 90% of first time freshmen students received financial aid in the form of scholarships, grants, loans and work-study compensation. During the 2014-15 academic year, out-of-state students paid $10,794 for tuition, while Minnesota residents and children of alumni received a discount on this rate. Those who opted to live on campus paid an additional $7,552 and spent approximately $4,103 on other expenses, such as additional course fees, transportation and technology. Textbooks and supplies for the year averaged $1,100. Undergraduates who choose to live in on-campus housing should be aware that subscribing to a university meal plan is mandatory. Over 97% of recent graduates have found employment or been accepted into a graduate degree program. The 7,500 undergraduate students can select from 206 majors and academic programs. 77% of first-time freshmen received grant or scholarship aid, averaging $4,270 per academic year. Nonresidents applying to LSU Alexandria can expect to pay annual tuition fees of $12,868, with an additional $1,200 allocated to supplies and textbooks. On-campus room and board is a popular option for out-of-state students and costs approximately $7,730. Other common expenses, like parking passes, course-based fees and personal expenditures, total to $3,048 per year. 92% of first-time undergraduates receive some form of financial aid, including grants, scholarships, student loans or work-study compensation. U.S. News & World Report ranked LSUA second in terms of lightest debt load incurred by students upon graduation. The university was ranked among the top 10 least expensive public universities for non-resident students by U.S. News & World Report in 2013. Over 2,000 undergraduate students call LSAU home, of which 65% are younger than 25. Out-of state undergraduates paid $13,512 in tuition for the 2014-15 academic year, nearly $10,000 less than the national average for non-resident students attending a public four-year institution. The university is also competitive when it comes to room and board costs, charging $5,158 compared to the national average of $9,804. Yearly textbook and supply costs totaled $1,200, while miscellaneous fees and expenses tacked on $2,110. 66% of the undergraduate student body received some form of grant or scholarship aid. 77% of incoming freshmen received a scholarship or grant, averaging $6,408 per academic year. Students can take advantage of more than 80 student organizations, including student government, honor societies, departmental clubs and special interest groups. ECU is one of the few schools in the country to offer a degree in cartography. Many students from outside Oklahoma choose to call Langston University home, thanks in part to its low non-resident tuition fees. During the 2014-15 academic year, students paid $11,589. The university recently adopted a flat-rate tuition policy, meaning students undertaking 12-18 credit hours pay the same rate. Room and board costs total $9,234 each year, while academic supplies such as textbooks add $1,200. Other miscellaneous and personal fees, including course-based supplies, parking passes and student center use, tack on an additional $2,760 per year. Langston University is the only historically black institution in Oklahoma, and also the westernmost historically black institution in the nation. Over 4,000 students take advantage of undergraduate and postgraduate degrees at the university's three campuses in Langston, Tulsa and Oklahoma City. During the 2012-13 academic year, 94% of first-time freshmen students received financial aid packages. In addition to serving thousands of Arkansas residents, many students from outside the state are drawn to UAFS for its competitive tuition rates. The most recent academic year saw non-resident students paying $10,511 for tuition, while those in the bordering states of Oklahoma, Missouri, Tennessee, Mississippi, Louisiana and Texas are eligible for the same rates as in-state students. Yearly room and board costs average $8,077, while miscellaneous costs and personal expenses come to $2,862. Textbooks and academic supplies add an extra $1,235 per year. Over 7,100 students are currently enrolled in 33 bachelor's degrees, 14 associate programs and 27 certification offerings. Over 90 organizations are active on campus, including a number of nationally recognized fraternities and sororities. 93% of incoming freshmen received grant or scholarship funds, averaging $7,824 per academic year. Out-of-state tuition at UTB totaled $14,744 for the 2014-15 academic year, with an additional $1,196 earmarked for textbooks and academic supplies. Room and board costs $5,474, nearly $4,000 below the national average. Other expenses, such as transportation, course-based fees and student center costs totaled to $2,927 per year. The university offers an installment payment plan for students unable to pay the lump sum upfront. UTB currently has just over 8,000 students; nearly 90% identify as Hispanic. The university is one of two institutions in the nation offering a master's degree in translation and interpreting taught wholly online. 62% of undergraduates receive grant or scholarship aid, averaging $4,851 per academic year. Out-of state tuition at Cameron University is over 40% less than the national average for public four-year universities, totaling $13,380 for the 2014-15 academic year. Room and board expenses, at $6,318, are also significantly lower than the national average. Students paid approximately $1,418 for textbook and school supplies, with an additional $3,018 earmarked for miscellaneous costs, including class-based fees, parking passes, student center fees and transportation. The university has a number of need-based and merit scholarships for those who qualify. The university offers more than 50 degree programs at the associate, baccalaureate and master's levels. The student body is richly diverse, with 43% identifying as a minority; students from 44 countries call CU home. U.S. News & World Report ranked CU as one of the top institutions nationwide for graduating students with the lowest debt load. Students residing outside Oklahoma paid $12,635 in tuition during the 2014-15 academic year at NSU, approximately 40% of the national average for non-resident students attending a public four-year university. Students hailing from Arkansas, Missouri, Texas or Kansas benefit from a quad-state waiver that allows residents to pay in-state tuition rates. Annual room and board fees total $6,670, while academic supplies and textbooks add $1,200 per year. The university estimates students will spend $1,914 on other expenses, such as laundry services, parking fees and class-specific costs. 5,371 undergraduate students are enrolled in 68 baccalaureate programs, while 414 postgraduate students have 26 programs available to them. The most popular fields of study include elementary education, biology, accounting, business, psychology, criminal justice and early childhood education. 84% of undergraduate classes have fewer than 30 students; 97% have fewer than 50. While out-of state residents pay $13,268 annually for tuition, the university has a policy allowing any student, regardless of primary residence, to receive in-state tuition if they qualify for an institutional scholarship of $1,000 or more due to a particular talent or ability. Students who choose to use campus-based room and board pay an additional $6,327 annually, alongside supply and textbook costs of $1,300. Other expenses, such as class-based fees, transportation costs and student center charges add an extra $2,500 per year. Over 30% of UNA's 7,100 students come from outside Alabama. Approximately 66% of students receive financial aid, averaging $5,000 per year. The average class is comprised of 25 students, while the student to teacher ratio holds steady at 23:1. Students from outside Missouri paid $9,853 in tuition during the 2014-15 academic year, less than one-third the national average for out-of-state students attending public four-year institutions. Room and board is slightly higher than the national average, totaling $9,250. Textbooks and class supplies add $800 per year, while extra expenses such as parking passes, transportation and laboratory fees average $5,000. The university has a flat-rate policy for credit hours, meaning students can take up to 16 hours for the same cost as 12. Students looking to further cut costs can take advantage of the university's textbook rental program. Nearly 85% of students receive some form of financial assistance, including scholarships, grants, work-study benefits or student loans. HSSU is home to nearly 1,300 undergraduates who take advantage of 30 majors, minors and certificate options. Non-residents of Missouri can expect to pay annual tuition rates of $13,378, less than 40% of national averages for out-of-state students attending a public four-year institution. Students living and dining on campus pay an additional $5,916, while academic supplies and textbooks total another $1,000 per year. Other expenses such as class-based fees, transportation, laundry services or student fees tack on approximately $3,052 each academic year. The university offers a number of academic and need-based scholarships to accepted candidates. LU is the only higher education institution founded by Civil War Veterans. Over 3,000 students currently attend the university and are enrolled in a variety of associate, bachelor's and master's level programs. 65% of undergraduates receive scholarship or grant aid, averaging $4,839 per academic year. Students applying to the University of Arkansas at Pine Bluff from outside the state can expect to pay $11,908 in annual tuition fees, though residents of Texas, Louisiana, Mississippi, Tennessee, Missouri, Oklahoma, Kansas and Illinois are eligible for discounts of up to 90% of the difference between in-state and out-of-state tuition. Room and board costs average $7,200 per year, while textbooks and supplies are an additional $1,000. Other expenses, including transportation, parking costs, student center fees and class-based additions, total $2,778 per year. While the majority of students at UAPB are enrolled in either associate or bachelor's programs, the university does have a select number of master's and doctoral programs available. 96% of all first-time freshmen receive some form of student aid; of these, 92% receive a grant or scholarship, averaging $8,319 per year. 73% of undergraduates took out a student loan, averaging $7,013 per year. Out-of-state students at Central Arkansas paid $13,806 for tuition during the 2014-15 year, although the university offers a variety of qualifiers for students to receive in-state tuition regardless of their primary residence. Room and board costs totaled $5,778 while books and supplies added $1,200 per year. The university has a number of other expenses it counsels students to plan for, including housing fees, transportation, technology and miscellaneous costs. During the most recent academic year, these costs totaled to $5,253. 11,698 students have access to 82 undergraduate, 14 graduate certificate, 31 master's, 12 specialist and six doctoral programs. Despite being a larger university, the student to faculty ratio remains low at 17:1. 77% of all undergraduate students receive scholarship or grant aid, averaging $7,764 per year. The prestigious programs offered by the South Dakota School of Mines and Technology draw a number of out-of-state students; during the 2014-15 year, nonresidents paid $13,560 in annual tuition fees. Those electing to live and dine on campus paid an additional $6,370, alongside $1,800 in yearly textbook and supply costs. Other expenses, such as parking passes, transportation, class-based fees and laundry services totaled $4,000. PayScale's 2014 College Return on Investment Report ranked SDSMT 19th nationally. Payscale's 2014-15 College Salary Report found that the average early-career salary for graduates of SDSMT was $65,600, with a 98% placement rate. The institution made the list of America's 100 Best College Buys for the 17th consecutive year. 62% of all undergraduate students receive scholarship or grant aid, averaging $4,795 per academic year. All students at the University of Minnesota, Crookston pay the same rate for tuition, making it an attractive destination for students across the U.S. In the 2014-15 academic year, this figure totaled $11,468. Room and board expenses amounted to $7,840, while textbooks and class supplies figured in at $1,000 per year. Other expenses, such as laboratory charges, parking fees and use of student centers, averaged $2,346 per year. UMC has a flat-rate policy, whereby tuition fees stop increasing after 13 credit hours per semester. 1,800 undergraduate students attend UMC, 700 of whom complete their classes via distance education. U.S. News & World Report has named UMC as one of the Best Colleges in the Midwest for the last 18 years. 57% of classes have fewer than 20 students; 81% have fewer than 30. More than 3,800 undergraduates are currently enrolled at Southeastern Oklahoma State University, many of whom take advantage of the institution's competitive out-of-state tuition rates: $13,992 for the 2014-15 academic year. Those electing to live on campus paid an additional $5,864 annually (including meals) and paid textbook and supply costs of $1,000. Students frequently encounter other expenses for laboratory-based classes, parking fees, use of student centers or transportation costs, estimated at $2,945 yearly. 91% of incoming first-time freshmen received grant or scholarship aid, averaging $7,482 per academic year. 45% of students took out a federal student loan to finance their education; these averaged out to $5,879 per year. 57% of first-time freshmen elected to continue their second year at SOSU. Washburn's nonresident tuition of $13,526 ranks among the lowest in America. Room and board costs total $6,541, while textbook and supplies average $1,000 per year. Expenses like laboratory fees, transportation, parking fees and use of student centers add $4,238 each year. The university has a number of need-based and merit scholarships available to qualifying students, totaling $7.9 million annually. Nearly 7,000 students take advantage of more than 200 programs offered at certificate, associate, bachelor's, master's and doctoral levels. U.S. News & World Report ranks the university as one of the best colleges in the Midwest. 92% of all first-time freshman students receive financial aid in the form of grants, scholarships, work-study programs and loans. Out-of-state students at Northwest Missouri State University paid $11,526 in annual tuition costs for the 2014-15 academic year, nearly $18,000 less than the national average. Room and board expenses total $8,226. Students frequently incur additional charges for laboratory fees, laundry services, parking fees and class-based needs, which the university estimates come to $2,500 per year. 5,491 undergraduates are currently enrolled, 37% of whom come from outside Missouri's borders. 126 undergraduate majors are available, as well as 40 graduate programs. 97.5% of graduates find employment or pursue further education within six months of graduation. Laptops and textbooks are included in the cost of tuition at NMSU, saving students nearly $7,200 over four years of education. At Rogers State University, non-Oklahoma residents spent $12,766 on tuition for the 2014-15 academic year, with an additional $8,190 for room and board. Textbooks and supplies totaled $1,723, while expenses like transportation, laboratory-based fees and personal costs averaged $2,530 each year. The school offers a number of scholarship programs to students meeting merit or need-based criteria. 88% of all first-time incoming undergraduate students receive some form of financial aid, ranging from grants and scholarships to work-study compensation and loans. In addition to its main campus in Claremore, over 4,000 students take advantage of two other campuses and online course offerings. RSU is the only university in the state offering a degree program in military history. 70% of all undergraduates receive grant or scholarship aid, averaging $4,945 per academic year. For the 2014-15 academic year, non-resident students who chose to study at Henderson State University spent $14,220 on tuition and fees. Many out-of-state students elect to live and dine on-campus, at least during their first years of education, costing an additional $6,048 ― nearly $3,000 below the national average. Books and supplies ring in at $1,200, while other miscellaneous and personal expenses average $4,276 per year. Over 3,600 students call HSU home and take advantage of 42 bachelor's and 11 master's programs. The university is committed to providing students with personalized study and mentorship: the current student to faculty ratio is 16:1. 95% of incoming first-time students receive grant or scholarship aid, averaging $9,155 per academic year. As the only Maryland-based institution to make our list of lowest out-of-state tuition, Coppin State University serves a wide range of non-resident students. In the 2014-15 academic year, students from outside Maryland spent $11,885 on tuition, with an additional $800 earmarked for textbooks and school supplies. Students who chose to live and dine on campus paid $9,336 annually, slightly above the national average. Other expenses frequently encountered include transportation, class-based fees, student services and loan fees; these totaled $3,386 during the previous academic year. CSU is a historically black college, with 83% of students identifying as African American. 3,383 students are currently enrolled in programs ranging from bachelor's degrees to doctoral programs. The student to faculty ratio is currently 14:1. During the 2012-13 academic year, 95% of all incoming first-time undergraduate students received financial aid in the form of grants, scholarships, loans and work-study programs. The table below shows that being an out-of-state student increases the cost of your education. Typically, a student who does not reside in the state where they attend school can pay two or three times as much in tuition at a public university. Private universities usually do not charge out-of-state students more, but they charge more overall. Public universities are cheaper because they receive some state funding. Out-of-state students pay more for tuition because they, or their families, haven't paid taxes in the state to help defray the cost of education. While there are various ways to help reduce costs, the best option is to attend school in the state where you have residency. Residency requirements vary, but in many cases you can complete an entire bachelor's degree without earning residency. Federal financial aid can help reduce the cost of tuition across the board through scholarship and grant opportunities. State-based financial aid is usually reserved for residents, but some states use it to bring in more students and grant aid to non-residents. While out-of-state tuition can be higher than resident tuition, there are several programs which allow students to pay the lowest out-of-state tuition. The Western Undergraduate Exchange allows students from 16 Western states and territories to pay reduced tuition at hundreds of schools within those states. The Midwest Student Exchange Program does the same with ten states in the Midwest. The Academic Common Market allows students in 16 Southern states to pay resident tuition at many schools regardless of residency. The Tuition Break program provides discounted out-of-state tuition for students from New England who study in other New England states. Each of these programs has unique requirements and covers different regions, but can help students save money when they study within certain regions. One way to save money on the cost of a bachelor's degree is to first earn your associate degree from a community college, and then transfer your credits to a university. Community colleges, sometimes referred to as two-year colleges or junior colleges, typically have much lower tuition rates than public or private universities. Many community colleges have transfer agreements set up with nearby universities which let you easily transfer your credits, allowing you to effectively take the first half of your bachelor's degree at a more affordable tuition rate. If you know where you want to go to school and what you want to study, this can be a great option. Check with your intended university to see if they have any such agreements with community colleges, and then work with academic advisors at each institution to make sure you take the right courses and don't end up repeating things when you get to the university. Cost is one of the many differences between private and public colleges, this difference is due to the way schools get their funding. Both rely on private donors as well as student tuition and fees, but public colleges get a large part of their funding from the state. State funding is not only why public colleges cost less, but why they usually have different tuition rates for residents and out-of-state students. Residents pay less because they, or their families, have been paying into the funding of the schools through taxes. Private schools usually charge the same tuition for everyone, but they charge more than public schools. As you can see from the table above, private schools cost on average around $9,000 more per year than out-of-state tuition. The cost of public universities has increased steadily over the years. Since 2000, public tuition has risen 136%, while private school tuition has only risen about 17%. For the time being, private colleges still cost more than public ones, but that gap is likely to close more as funding for higher education continues to slow down. There are other differences between the two, such as the number of students enrolled or degree options offered. Public universities tend to enroll more students and offer a wider array of degrees, while private universities tend to enroll fewer students and have more focused degree options. If cost is not your primary consideration, you might find better options at private colleges. Another consideration when looking for the lowest out-of-state tuition is online versus on-campus learning. Online programs have grown dramatically in recent years and have become an increasingly viable way to earn a degree. Many colleges charge one flat tuition rate for online students regardless of their residency, mainly because those students are not taking advantage of on-campus resources. Non-resident students might still pay more at certain colleges for online programs, but these schools are in the minority. In addition to saving money on tuition, online students have more flexibility in where they live. Not all college students live on campus, but housing in areas near major universities tends to be expensive, and affordable housing might result in a significant commute. Online students do not have to worry about being on campus, and can easily study from out-of-state. As you can see from the table below, living on-campus can add significantly to the cost of your degree. Online learning can be the key to attending a school out of state or the key to attending one in your state for a lower cost. There are several types of financial aid available. Student loans are the best known, but there are also scholarships, grants, and work-study programs. While you can find a variety of these through internet research or by talking to financial aid advisors, you should always start by filing a Free Application for Federal Student Aid (FAFSA). The FAFSA not only gives you access to federal aid but is also required as part of the application process for many other funding options. Grants are awards of money, often from the government, which usually do not have to be repaid. Filing the FAFSA may qualify you for small grants, though probably not enough to pay for college. Larger grants are often geared toward graduate-level research. Grants can come from many sources and are often awarded to certain student populations, such as education students. There are some grants, such as federal TEACH grants, which require recipients to work in a certain field or region for a specific amount of time after graduation or repay the grant. Applying for grants is much like applying for scholarships, and a good place to start looking is your school's financial aid department. Work-study programs place you in jobs on- or off-campus. Your pay during the semester or school year will total the amount you have been awarded through the work-study program. Work-study is a good way to gain experience and have your wages put directly toward your education costs. Wages, hours worked, and other factors will vary by state or municipal laws. While work-study programs have many benefits, they can be difficult for online students, as jobs are generally located near the college participating in the program. Student loans are the most common form of financial aid. Most are federal or state loans, which come with lower interest and more repayment options than private loans from banks or other lenders. Most of the money from federal aid is in the form of loans. There are two kinds of government student loans: subsidized and unsubsidized. Subsidized loans do not require you to pay interest on them while in school or for the first six months after you graduate; they are only awarded to students who demonstrate financial need. Unsubsidized loans accrue interest from the date they are awarded and offer no post-graduation grace period. They are also the only kind of loans available to graduate students. Private loans follow rules established by the lender and should be a last resort when considering financial aid. Scholarships are awards of money that, like grants, do not have to be paid back, but come from schools, organizations, and other private interests. Scholarships are competitive, meaning you must prove you need the funds or will make better use of them than anyone else. Most scholarships are geared toward specific student populations. Scholarship requirements may be as broad as being from a certain state to as narrow as applying to a specific program at a certain school. Scholarships exist for most populations and most fields of study. You can learn more about scholarships offered by your school from the financial aid department or the staff of the department in which you study. Scholarships come in different amounts, but most tend to be small, and paying for an entire semester, much less a degree, can be difficult. There are many scholarships available to students but finding those that are applicable to you can be a daunting task. If you know what you want to study, begin by checking with your department or doing an internet search. There are numerous websites that can help you find scholarships, including the FAFSA site. Start looking for scholarships early. Applications are usually due before the academic year in which they will be applied, and they nearly always require an essay or letter of intent. When you find a scholarship for which you qualify, apply for it. There is no reason to limit yourself, as you can accept and combine multiple awards in order to pay for your degree. Adopt healthy spending habits: Reducing your spending in college can result in fewer loans, which will save you money in the long run. Tools like Spending Tracker, Habitica, and Slice can help you save money and develop good spending habits. Be careful with credit cards; use them to build credit responsibly. Many banks and credit unions offer courses in fiscal responsibility and other skills to help you save money. At-home meal preparation: Food can cost a great deal if you aren't careful. Preparing your meals beforehand or eating at home can save you a lot of money. There are apps that can help you plan your meals and others that can help you reduce costs when you dine out. Buying groceries is generally cheaper than dining out. Use student discounts: Student discounts can be found in many places. Some online retailers offer discounts to students who provide a university email address. Restaurants and shops located near campus often offer discounts as well, if you show your student ID. Many of these discounts are not clearly advertised; you may have to do some research to find them. Find cheap textbooks: One of the most expensive things about college is textbooks, but there are some ways around this. Online retailers sometimes charge less, and e-books are sometimes an option. Some books can be checked out from the library instead of purchased, and buying used books whenever possible saves a lot of money. Increase credit load: Another way to save money in the long run is to take a heavier course load. While more credits means you will pay more and have to work harder in a given semester, it can also mean graduating earlier. Spending less time in college means less money on room and board and less money on tuition, which generally increases annually. Provided by the United States Department of Education, this site provides resources regarding financial aid and other subjects of interest to current and future college students. This site provides tools to determine the total potential cost of your degree, as well as comparisons of tuition in order to figure out where to find the lowest out-of-state tuition. NASFAA provides information on student financial aid, including opportunities within specific states, to make understanding, finding, and utilizing financial aid easier. The NCES collects a huge amount of data about higher education, including tuition rates, fees, and other expenses across the country, which can help you find the most affordable option. Among other resources, FinAid provides information about the in-state residency requirements for many states, as well as general advice for obtaining residency.